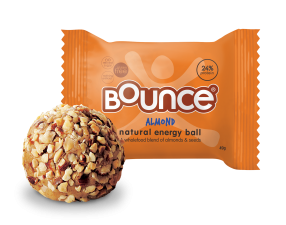 Bounce has the perfect treat just in time for Autumn, the Bounce Almond Protein Ball. The orange packaging is distinctive and contains an Almond Protein Ball packed with natural energy to keep you moving. Bounce Foods nutritionist Susie Burrell said: “As the weather starts to cool, it’s easy to throw your new year health goals out the window”. “Bounce’s Almond Protein Ball is the perfect snack and size to throw into your bag when you’re tight on time or need a pre-gym boost,” Ms Burrell said. “This ball is packed with 12 grams of high-quality protein, including the king of nuts, which are key ingredients to keep you fuller for longer. Bold and a little nutty, Bounce’s Almond Protein Ball is the snack for autumn. Punching above its weight, the Almond ball has the optimum balance of high-quality proteins, complex carbohydrates and unsaturated fats. These unsaturated fats help to lower the risk of heart disease, and maintain normal cholesterol.